High protein (high fat) diets are in vogue today and are heavily promoted. Unfortunately they are also dangerous. The popularity of these books is evidence that people are looking for a quick, effortless way to lose weight without having to curtail their dangerous love affair with rich, unhealthful foods. People are desperate to lose weight and these books preach what people want to hear; that you can still eat lots of cholesterol and saturated fat and still lose weight. This illicit romance can lead to tragic consequences, with some people literally dying to lose weight. High protein diet gurus usually claim they know the truth and all other doctors and scientists are wrong. They promote the idea that their recommended diet is healthy. They would have their devotees believe there is a worldwide conspiracy, including more than 3500 scientific studies, involving more than 15,000 research scientists, reporting a relationship between the consumption of meats, poultry, eggs and dairy products, with heart disease, cancer, kidney failure, constipation, gallstones, diverticulosis, and hemorrhoids, just to name a few. Robert Atkins' books, as well as other authors advocating high-protein weight loss plans, recommend diets with significantly more animal products than is typically consumed by the average American. Americans already eat approximately 40% of calories from animal products1 and as a result of such nutritional extravagance we have seen a tragic skyrocketing in cancer rates and heart disease rates in the last 50 years. As we track animal product consumption around the world in every population, we note as animal product intake increases, so does both cancer and heart disease. Atkins recommends that you eat primarily high fat, high protein, fiber-less, animal foods and attempt to eliminate carbohydrates from your diet. Analyses of the proposed menus show animal products to comprise more than 90% of calories in the diet. You can lose some weight on the Atkins’ Diet, but you will damage your health at the same time. Following Atkins’ recommendations could more than double your risk of certain cancers, especially of meat-sensitive cancers3, such as epithelial cancers of the respiratory tract.4 For example, in the last study previously referenced, conducted by the National Cancer Institute, they looked at lung cancer in non-smoking women, so that smoking would not be a major variable. They found that the relative risk of lung cancer was six-fold greater in women in the highest fifth of saturated fat consumption, compared to the lowest fifth. Of note is that the high level of saturated fat shown to dramatically increase cancer in this study was still much less than the saturated fat than found on the typical Atkins’ menu. Specifically, fruit exclusion alone is a significant cancer marker. 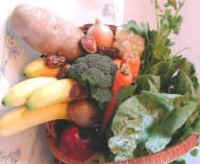 Stomach and esophageal cancer, are linked to populations that do not consume sufficient fruit.6 Scientific studies show a clear and strong dose-response relationship between cancers of the digestive tract, bladder and prostate with low fruit consumption.7 To the surprise of many investigators, fruit consumption shows a powerful dose response association with reduction in mortality from heart disease, cancer and all causes of death.8 There is also a striking consistency in multiple scientific investigations that show a reduction in incidence of colorectal and stomach cancer with the intake of whole grains.9 Colon cancer is strongly associated with the consumption of animal products.10 And these researchers concluded that the varying level of colon cancer in the low incidence population compared to the high incidence population could not be explained by “protective” factors such as fiber, vitamins and minerals; rather it was influenced almost totally by the consumption of animal products and fat. Atkins’ menus average 60-75% of calories from fat and even his more permissive diets contains an insignificant quantity of fruit. There are numerous ways to lose weight. However "effective" they may be, some are just not safe. We wouldn't advocate smoking cigarettes or snorting cocaine simply because they can be effective in promoting weight loss. Advocating a weight-loss program based on severe carbohydrate restriction is irresponsible. You may pay a substantial price—your life! After significantly increasing your risk of developing cancer in years to come, what about your heart? The Westman study, funded by the Atkins Center (with a long-term funding arrangement) and interpreted to the media by Atkins and his employee spokespeople, is another example of how money buys influence at the expense of the unsuspecting public. This short-term study showed a moderate degree of weight loss for about 80% of the initial participants and an average of 10 mg/dl (or 5%) decrease in LDL (bad) cholesterol levels.11 It was heralded to the media as proof that the Atkins diet is safe for the heart. It is well established that blood fat levels fall as body fat decreases. With any method of weight loss we will see drop in cholesterol levels. But, in spite of taking fish oils and other supplements known to reduce cholesterol, this study showed an unusual resistance to the expected fall in lipids we see with other methods of weight loss. Television networks repeated aired interviews with Atkins his representatives to interpret a study paid for by the Atkins’ institute. In contrast, an independent, peer-reviewed, extremely comprehensive study on the effects of individuals following an Atkin’s approach studied heart function with before and after blood flow evaluations with sophisticated medical tools including myocardial perfusion imaging, echocardiograpy and serial blood work. The study showed the blood flow to the heart diminished by an average of 40% after one year on such a high saturated fat, high protein diet and increased inflammatory markers that predict heart attacks.12 In contrast, a low saturated fat diet given to the control group improved blood flow to the heart by more than 40%. This study clearly illustrated a high protein diet is too dangerous for anyone to consider, even for a short time. Of course this study was ignored by the media as it wasn’t promoted by the Atkins organization high profile publicity department. It has also been found that ketogenic diets can cause dilatation of the heart muscle and cardiomyopathy that is reversible if the diet is stopped in time.13 Many readers may remember Dr. Atkins himself had a heart attack about a year ago caused by a cardiomyopathy. Of course, the spin was that it had nothing to do with his diet and was due to a virus. When we restrict carbohydrates so markedly, the body thinks we are caloric deprived and ketosis results. The body begins to lose fat, even if we are consuming plenty of high-fat foods, as Atkins recommends. Once you stop the diet, you’ll gain it all back and more; if you stay on the diet, you risk a premature death. Take your pick. Once you start consuming carbohydrate-containing fruits, vegetables or beans, the ketosis ends and the meat and fat become fattening again. Meat consumption leads to weight gain, unless you have caused a carbohydrate-deficiency ketosis. These high-protein diets strongly forbid refined carbohydrates, junk food, and the nutritionally depleted white pasta, white rice, and bread that most Americans consume in large quantities. That is the good part. They also frequently recommend the dieter consume hundreds of dollars of nutritional supplements each month. Sure the supplements are better than nothing on such an unbalanced diet, but they do not make it safe. The reality is that no matter how many supplements are taken and how much psyllium fiber prescribed, it is simply impossible to make up for so many important substances that are lacking in the diet. There are too many essential nutrients that have never met the inside of a vitamin jar and no supplemental gymnastics can ever offset the destructive effects of so much animal products and so little fibrous produce. Plus, on an Atkins type plan, if you consume even a moderate amount of the healthy carbohydrate foods such as fruits and starchy vegetables, you stop ketosis and regain your weight. High fat diets are unquestionably associated with obesity 14, and meat eating actually correlates with weight gain, not weight loss, unless you radically cut carbs out of your diet to maintain a chronic ketosis. Researchers from the American Cancer Society followed 79,236 individuals over 10 years and found that those who ate meat more than three times per week were much more likely to gain weight as the years went by, compared to those who tended to avoid meat.15 The more vegetables the participants ate, the more resistant they were to weight gain. Ketogenic diets, like Atkins’, have been used to treat children with seizure disorders when unresponsive to medication alone. Medical studies reveal these diets can result in serous health consequences. Investigators report a greater potential for adverse events than had ever been anticipated. The dangers of these high protein diets include hemolytic anemia, abnormal liver function, renal tubular acidosis, spontaneous bone fractures (despite calcium supplementation), and many more.16 Kidney stones formation is another risk of high protein diets.17 These studies point out that there are many subtle adverse outcomes not being attributed to this dangerous way of eating. These dangers of the Atkins’ and other high protein plans have to be considered within the context of the results obtainable with my Eat To Live approach, an approach designed to reverse heart disease as one dramatically loses weight. Like Atkins, I also recognize that refined carbohydrates are dangerous, however rather than replacing them with an unlimited license to eat more saturated-fat-rich animal products, they are replaced with high phytochemical-rich vegetables, beans and fruit. It offers more dramatic weight loss, substantial cholesterol lowering and not only is safe, but designed around the most powerful anti-cancer and anti-heart disease foods on the planet. When we look at medical research studies performed on the Eat To Live, vegetable-based approach we see an average lowering of the LDL (bad) cholesterol of 33%,18 which is more impressive than the most powerful cholesterol lowering drugs. By the way, this reduction dwarfed what could be achieved by subjects eating a Mediterranean diet or the modern low-fat diet recommended by the American Heart Association. Reverse heart disease with filet mignon! Stop strokes with cheese! Prevent breast cancer with butter! The worst part is that most people do not have a comprehensive knowledge of the world’s nutritional literature and research and are therefore not in a position to evaluate his many fraudulent claims. He gets away with it because the government only actively monitors statements made on products. Can you imagine if the butter manufacturers placed the statement prevent breast cancer with butter on the side of a stick of butter, especially in light of thousands of studies showing the relationship between saturated fat and cancer. Never forget my recurrent admonition; do not be satisfied with mediocrity. Nutritional mediocrity might just cause your death. Only a cholesterol level below 150 and an LDL below 100 are satisfactory. Atkins’ devotees never reach these desirable levels, while those following my recommendations routinely do. Make no doubt about it, weight control and healthy eating are a lifetime commitment. No quick fix or dangerous weight loss scheme will result in permanent weight reduction and good health. For superior health and your ideal weight there is only one optimal approach, Eat To Live. 2 Tavani A, La Vecchia C, Gallus S, et al. Red meat and cancer risk: a study in Italy. Int J Cancer 2000;86(3):425-428. 3 De Stefani E, Fierro L, Mendilaharsu M, et al. Meat intake, “mate” drinking and renal cell cancer in Uruguay: a case-control study. Br J Cancer 1998;78(9):1239-1243. Risch HA, Jain M, Marrett LD, Howe GR. Dietary fat intake and risk of epithelial ovarian cancer. J Natl Cancer Inst 1994;86(18):1409-1415. 4 Pillow PC, Hursting SD, Duphorne CM, et al. Case-control assessment of diet and lung cancer risk in African Americans and Mexican Americans. Nutr Cancer 1997;29(2):169-173. Alavanja MC, Brown CC, Swanson C. Brownson RC. Saturated fat intake and lung cancer risk among nonsmoking women in Missouri. J Natl Cancer Inst 1993;85(23):1906-1916. 5 Kuller LH. Dietary fat and chronic disease: epidemiologic overview. J Am Diet Assoc 1997;97(7 Suppl):S9-S15. Willet WC. Nutrition and cancer. Salud Publica Mex 1997;39(4):298-309. La Vecchia C. Cancer associated with high-fat diets. J Natl Cancer Inst Monogr 1992;12:79-85. Steinmetz KA, Potter JD. Vegetables, fruit, and cancer prevention: a review. J Am Diet Assoc. 1996;96(10):1027-1039. 6 Brown LM, Swanson CA, Gridley G et al. Dietary factors and the risk of squamous cell esophageal cancer among black and white men in the United States. Cancer Causes Control 1998;9(5):467-474. Cheng KK, Day NE. Nutrition and esophageal cancer. Cancer Causes Control 1996;7(1):33-40. Hirohata T, Kono S. Diet/nutrition and stomach cancer in Japan. Int J Cancer 1997;Suppl 10:34-36. Kono S, Hirohata T. Nutrition and stomach cancer. Cancer Causes Control 1996;7(1):41-45. Terry P, Nyren O, Yuen J. Protective effect of fruits and vegetables on stomach cancer in a cohort of Swedish twins. Int J Cancer 1998;76(1):35-37. 7 Willet WC, Trichopoulos D (eds). Nutrition and cancer: a summary of the evidence. Cancer Causes Control. 1996;7:178-180. La Vecchia C, Tavani A. Fruit and vegetables, and human cancer. Eur J Cancer Prev 1998;7(1):3-8. Tavani A, La Vecchia C. Fruit and vegetable consumption and cancer risk in a Mediterranean population. Am J Clin Nutr 1995;61(6):1374S-1377S. 8 Key TJA, Thorogood M, Appleby PN, Burr ML. Dietary habits and mortality in 11,000 vegetarians and health conscious people: results of a year follow up. British Medical Journal 1996;313:775-779. 9 Jacobs DR, Slavin J, Marquart L. Whole grain intake and cancer: a review of the literature. Nutrition and Cancer 1995;24:221-229. 10 O’Keefe SJ, Kidd M, Espitalier-Noel G, Owira P. Rarity of colon cancer in Africans is associated with low animal product consumption, not fiber. Am J Gastroenterol 1999;94(5):1373-1380. 11 Westman EC, Yancy WS, Edman JS, et al. Effect of 6-month adherence to a very low carbohydrate diet program. Am J Med 2002;113(1):30-36. 12 Fleming RM. The effect of high-protein diets on coronary blood flow. Angiology 2000;51(10):817-826. 14 Sherwood NE, Jeffery RW, French SA, et al. Predictors of weight gain in the Pound of Prevention study. Int J Obes Relat Metab Disord 2000;24(4):395-403. Astrup A. Macronutreint balances and obesity: the role of diet and physical activity. Public Health Nutr 1999;2(3A):341-347. 15 Kahn HS, Tatham LM, Rodriguez C, et al. Stable behaviors associated with adults’ 10-year change in body mass index and likelihood of gain at the waist. Am J Public Health 1997;87(5):747-757. 16 Bankhead C. Ketogenic diet can cause serious adverse effects, data suggests. Medical Tribune 1998;39(17)23. 17 Licata AA, Bow E, Bartler FC, et al. Effect of dietary protein on urinary calcium in normal subjects and in patients with nephrolithiasis. Metabolism 1979;28:895. Robertson WG, Heyburn PJ, Peacock M et al. The effect of high animal protein intake on the risk of calcium stone formation in the urinary tract. Clin Sci 1979;57;285. Brokis JG, Levitt AS, Cruthers SM. The effects of vegetable and animal protein diets on calcium, urate and oxalate excretion. Br J Urol 1982;54:590. Robertaon WG, Peacock M, Heyburn PJ, et al. The risk of calcium stone formation in relation to affluence and dietary animal protein. In: 34 Brokis JG, Finlayson B, eds. Urinary calculus, International Urinary Stone Conference. Littleton Col PSG Publishing, 1981:3. 18 Jenkins DJ, Kendall CW, Popovich, et al. Effects of a very-high-fiber vegetable fruit and nut diet on serum lipids and colonic function. Metabolism 2001:50(4);494-503. 19 Alavanja MC, Brown CC, Swanson C, Brownson RC. Saturated fat intake and lung cancer risk among nonsmoking women in Missouri. J Natl Cancer Inst. 1993;85(23):1906. Lichtenstein AH, Kennedy E, Barrier P, et al. Dietary fat consumption and health. Nutr Rev 1998;56(5)pt2;S3-S28. Kromhout D, Bloemberg B, Feskens E,et al. Saturated fat, vitamin C and smoking predict long-term population all-cause mortality rates in the Seven Countries Study. Int J Epidemiol 2000;29(2):260-265. Staessen L, De Bacquer D, De Henauw S, et al. Relation between fat intake and mortality: an ecological analysis in Belgium. Eur J Cancer Prev 1997;6(4):374-381.